I have submitted three pieces to the 2015 Spirit of Place event now in progress at the Heritage House in downtown Westport, NY. The first is a small wall hanging titled Waking Up Beside You In The Dark. It is assembled from a melted Cuisinart and broken shards of Christmas tree ornaments from my childhood. It was more than a decade ago that I spent a week or two melting and burning a whole range of household appliances and electrical equipment in a search for new forms. My young friend Kyle Blemel who was working with me that summer abetted me in this project. (Apparently our exercise in destruction did him no harm as he is now a successful industrial designer.) However the only new forms that emerged were rather gross and useless except for this white piece which lived for years on the barn wall as a fascinating grotesque before it fell and broke two years ago suddenly revealing the grinning skeleton riding on a skull. Then just this spring I added the broken ornaments. The second piece, also a junk sculpture, is intended for installation in a garden pool or pond, or perhaps a gentle stream. It should rest on a large flat rock just at water level. It is titled Birds Feeding and happened suddenly this spring when I was given the strange thing that appears to be a manually operated auger. I entangled the auger with an unidentified object I had pulled out of the swamp when I first moved here, and then I added the golden ornament that was in play because of the work on Waking Up Beside You In The Dark. The third piece, a portrait of winter in my wetland, is a small oil on panel I called Styx because I was reading around in a strange multi-author translation of Dante’s Inferno I had borrowed from the wonderful Wadhams Free Library. It is the most recent of the many photo-realistic paintings I have made. I work from small prints of photos I have taken, sometimes dozens of the same subject. The small size of the photo print provides a rigorous focus. I go back to the painting again and again over as much as a year, often examining the print I have chosen with a magnifying glass. I find many gestures in the print where it seemed at first there was only one, many different perspectives, different visual stories buried there. When I am fortunate the painting, usually itself quite large allowing room for all I have discovered, seems to hover and breathe. One of these large format paintings now hangs in the meeting room of the Essex Town Hall. It is called Election Day, and I introduce it here to talk about another facet of my work that is central to my experience with the spirit of this place. I think of this painting as depicting three constituents of life on Earth. In order of seniority and specific gravity they are the ancient rock, the numberless grasses and constitutional democracy. I think of democracy as being represented in the painting by the unknown that lies over the hill. That is what I like best about our Election Day, the convivial manner in which we confront the unknown and all toss our futures into the air together. It seems uniquely modern to me, joyfully scientific, that we should have a public celebration of uncertainty. So my work has a philosophical bent. As a theater director in New York, I was an early associate of Joe Papp, impresario of the famously radical and obstreperous New York Shakespeare Festival and Public Theater. It was at the Public that I directed the first off-Broadway play to win a Pulitzer Prize. Later I won an Obie for myself, working at the Brooklyn Academy of Music. But more than anything I loved the big tough city and came to know it from many angles. I was a single parent, drove a cab, taught acting, won a rent strike, was a freight brakeman on the Penn Central Railroad, and part of an investment banking firm with its offices at One World Trade Center. We specialized in creating privately placed, tax-exempt bonds for rural health care institutions. I loved the action, loved being in the big world, but more and more I came to feel that we were losing ground, the city was changing in bad ways, that everything we did somehow didn’t matter. These feelings, whether hormonal, doctrinal, or simply very private are common enough in the human story, a powerful force. In my case the response to a growing distemper was, after a lot of looking both inward and outward, to put my art-self in a direct, creative, unmediated relationship with the wilderness and civilization of the Adirondacks. I wanted to be formed not by the conventions of the world power center in New York, however magnificent, but by the instinct for bravery, freedom and mutual caring as it is lived here up north in the cold. I wanted to enter this landscape to be changed by it and work to create a refuge here in an increasingly difficult world. Of course I was not alone. My eclectic background has allowed me to be of help in the restoration and growth of the Wadhams Free Library, “the little library with a big window on the world”, also in the re-writing of the Town Plan and Zoning Ordinance for the town of Essex in my role as Planning Board Chair, and the regeneration of the Whallonsburg Grange Hall now celebrating its Centennial as a vibrant community center and cultural engine in the Boquet valley. But getting back to junk. Rusted junk has an honored place here. Life can be hard. We know how to make do, to improvise. Brooklyn where I lived for thirty years is another place that understands junk and hard times. Broken refugees recover there, and then their children grow up to write great music and Broadway plays. As for me, I love junk and always have. I remember as a boy finding something in the grass and wondering where it came from and how it got that way. Junk has memory and junk suggests possibilities. I love it because it talks to us about our common origins, how we all come from a long line of junk. I love it because it awakens unknown futures. Our very sun is a junk star, made of the debris of earlier stars. Regeneration, the indomitable growth of new life from old, is for me the spirit of this place. Please visit me at the Art Farm on the CATS Art Farm Trail outside of Wadhams. See some monumental junk sculpture and other fine art in a gorgeous setting. The Memory Tree (2013) at the Art Farm. Here is Kathy Recchia's report on the wonderful Columbus Day weekend at the Art Farm. On the 24th of April, Ted gave an illustrated lecture at the Wadhams Free Library describing past and present springtime work at his art farm in Wadhams. The Art Farm is now open by appointment (call 962 4386) and will be open to the public later in June. Above is the Library's poster for Ted's lecture. Here are some scenes from yesterday's studio tour. It was really nice to see everybody undeterred by the rain. We are open again today from 10 AM to 5 PM. The weather promises to be a brighter today. We look forward to seeing you. I have been working all summer refurbishing the house and grounds. Now I am looking forward to opening the place up briefly on the Boquet Valley Studio Tour coming up October 6 and 7. There won't be any brand new stuff, but I"m bringing up some favorite pieces that haven't been on view for a while. The Angel of Inerrancy is back home thanks to Jim Morse and his crew, and the house will be open showing off my new teaching studio and and a more intimate exhibition space upstairs. This fall I will again be teaching acting, but in a somewhat different group format - more about that later - and soon adding a video capability. A best of all I look forward to painting again - all winter. I look forward to seeing you soon. Scene study classes in groups of six will resume Thursday evening January 26 and places may be claimed now. A student is asked to commit to eight two-hour classes at a cost of $220 per person for the eight weeks. Students begin with a monologue and then join with a partner to work on a scene. Scenes and monologues are chosen either from Shakespeare or modern classics of the last hundred years and are selected in consultation with the student to meet particular goals. The work can be demanding and students are encouraged to work with their partners between classes. Ted is available for consultation outside of class and the studios can be used for scene rehearsal by arrangement. Additional meeting days, perhaps on the weekend are under consideration. Call Ted for further information or to sign up. Opportunities for individual and paired study at a basic rate of $100 per hour are also offered. Discounts are available for students, seniors and by special arrangement. These classes include spatial and movement work, character study and vocal training as well as monologue and scene study. Courses of study can be designed to meet particular needs and challenges. The teaching philosophy is eclectic and need based, with a foundation in what is commonly called the Method. Mr. Cornell trained at the Yale Drama School with Stella Adler and pursued a career in New York as a director before moving to the Adirondacks. He was an early associate of Joseph Papp at the Public Theatre and taught acting at NYU, Circle in the Square, Hofstra University, Ohio University and The Actors Studio. He is an Obie Award winner. Former professional associates include Ellen Burstyn, Olympia Dukakis, Raul Julia, Al Pacino, & Martin Sheen. The work is rigorous, offering an opportunity for meaningful self-examination and dramatic change. It has proven useful not only to actors but to writers, professionals and students. Setting "Ado" in the world of baseball was a perfect match to the story and to the energy of the production directed by Daniel Billet – who also played the role of Don Pedro. The talent and great chemistry of this cast – the energetic verbal sparring between Beatrice and Benedick, the effervescent longing between Hero and Claudio– reminded us again of why we love this classic piece. The cast also featured a fantastic appearance of local artist of former Public Theatre fame, Ted Cornell. "I hope that people will walk away from this play with a love of America, Shakespeare, and baseball," said Treadwell. I think that Treadwell did just that and also accomplished the enormous task of getting a community together to experience wonderful professional Shakespearean theatre on a Sunday afternoon. Much Ado About Nothing was performed on September 4th by the American Studio Theatre in Ballard Park in Westport, New York. The production featured Carrie Treadwell as Beatrice and Kirby Grubb as Benedick. 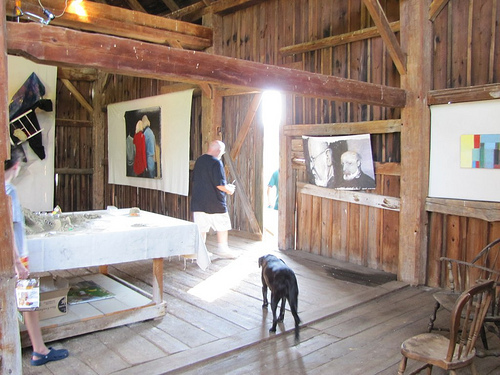 The Art Farm at Crooked Brook Studios in Wadhams will be open October 7, 8 & 9 from 10am to 6pm. Paintings, drawings, and constructions by the Farm's proprietor Edward Cornell are on display and offered for sale. Refreshments will be available. If you wish to make any special arrangements, or to tell me when you will be coming, please let me know at 518 962 4386 or cornelle@westelcom.com. The Art Farm is pleased to be participating in the Boquet Valley Studio Tour 2011 which is being held Columbus Day weekend. The Farm House Studio at the Art Farm will be open all winter for showings and classes, and there will be special events at holiday times. Classes and showings may be scheduled by appointment and will be announced by email and on the website. I look forward to seeing you at the Art Farm, Crooked Brook Studios, in Wadhams. I hope you are making plans to see American Studio Theatre's production of Shakespeare's incredible Much Ado About Nothing on Sunday, September 4 at 2 PM in Ballard Park in Westport, New York. This is the company founded by Carrie Treadwell and friends which has gathered in Westport every year for the last ten years for one extraordinary weekend of intense inspired concentration to rehearse and present for one performance only one the bard's classics. Anyone who saw last year's Two Gentlemen of Verona or the magical Henry V of two years ago will every forget those shows or fail to be there this Sunday. Carrie is playing the sharp witted, unstoppable Beatrice who finally meets and makes her match. Dan Billets who gave us last years hilarious and inventive Two Gents directs, and your blogger returns as the mysterious Friar Frances. Don't miss it.